Experiences with the pillow: I'm a bit unhappy the pillow I found at Macy's wasn't quite long enough, so I'm thinking of stuffing the ends a bit more. It's also a bit large so it pretty much forms a wall in bed between me and my wife. This is unfortunate in many ways. But it's quite a bit more comfortable than her. This entry was posted in Uncategorized and tagged dakimakura, dlsite, pillow, 抱き枕. Bookmark the permalink. I am tall and she's about the same height as the pillow.They do make male pillows. 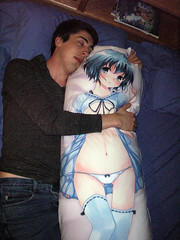 But I personally don't see anything wrong with a girl with a girl pillow.